Bluetooth technology allows you to establish a wireless connection between your BlackBerry Smartphone and a Bluetooth enabled device, such as a wireless headset or another smartphone. Bluetooth has to be enabled on both devices before it will connect properly. After Bluetooth has been enabled on both devices, you then have to pair them together so they can make a connection. In most cases, you will only have to pair a device one time. Once both devices are enabled and paired, you will be able to connect them together as long as you are within range of your BlackBerry. Typically, this range is approximately 10 meters. It works best if your phone is in a direct line of sight of the Bluetooth device. For example, if your BlackBerry phone is on the left side of your body, you should wear the Bluetooth headset on the left side. You will see Bluetooth status indicator lights on the Home screen when Bluetooth is enabled and you are connected. Before you can start using Bluetooth, you first have to enable it on your device. Click the Manage Connections icon from the Home screen. Check the Bluetooth check box. When you are finished, if you want to turn Bluetooth off, simply remove the check from the Bluetooth check box. Before Bluetooth will work properly, you have to pair your BlackBerry with a Bluetooth device. Click the Manage Connections icon from the Home screen. Click Bluetooth Connections, click Add New Device and then click Search. Click a Bluetooth device listed. If the Bluetooth device is a wireless headset, type the pairing passkey for the Bluetooth device on the BlackBerry. If you need help with this passkey, refer to the documentation that came with the Bluetooth device. If the Bluetooth device has a keyboard, such as a laptop, enter a pairing passkey of your choice on the laptop and the BlackBerry. Your BlackBerry may try to connect to a Bluetooth enabled device automatically if Bluetooth is turned on and they are within range. For this reason, it is usually best to keep Bluetooth turned off until you are ready to use it — this is also a wise security measure to protect your BlackBerry too. It only takes seconds to enable it back again. Before you start this process, make sure Bluetooth is enabled on your phone and paired with a Bluetooth enabled device. You will be using the shortcut keys to turn on BlackBerry Bluetooth in the instructions below. Click the Manage Connections icon on the Home screen, and then click Bluetooth Connections. Select a Bluetooth enabled device listed to highlight it, press the Menu key, and then select Connect. You can use Bluetooth on your BlackBerry to transfer files or images from your phone to another mobile device. Enable Bluetooth for both devices before starting. 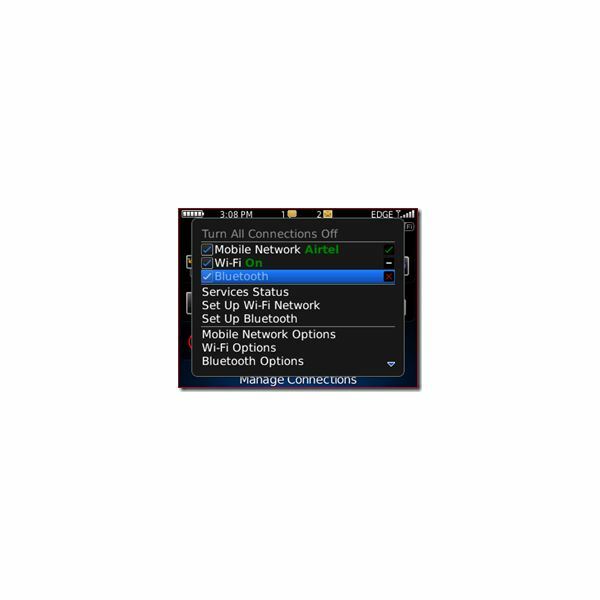 Click Manage Connections from the BlackBerry icon screen, and check the box next to Bluetooth. On each phone, click the Options icon from the Home screen, and then click Bluetooth. Press the Menu key and click Options. Select Yes for the Discoverable option, and press Escape to exit. Click Yes to save. Click the Manage Connections icon again from the Home screen. Click Bluetooth Options, press the Menu key, and then click Add Device. Your phone will search for any Bluetooth devices within range. When it finds the device, the name of the device will display on the screen, and ask you for confirmation. Click the device’s name to confirm. Follow these same steps for the other BlackBerry device. When you are finished and try to access the devices, you will be asked to enter a passkey. By default this passkey is 0000. A message appears on both phones that pairing is completed. The Bluetooth device will appear in the list of paired devices. If you want to be a bit more specific in the way you use Bluetooth on your BlackBerry, then it's worth bearing in mind that you do have some options available. Click Options from the Home screen, and then click Bluetooth. Device Name is the first option listed. This is the name that is shown when you make a connection to a computer. Discoverable is the next option. This states whether the device is available to be paired or not. This should be set to No until you are ready to pair. Connect On Power Up is the next option. If you have this set to yes, you will receive a signal from your Bluetooth each time it fails to make a connection to another device. Next, you will see a list of services that are compatible with your device. These are all checked as default. You can leave it like this, or you can only check the Bluetooth devices that you want to use. The process is pretty straightforward, but if you run into any problems, please leave a comment below.